Clarification of water using coagulating agents has been practiced since ancient times. The use of alum as a coagulant dates back to the Romans around 77 AD, and by 1757, England was using alum for coagulation in municipal water treatment. This clarification process remains essential in various water treatment disciplines today. In the modern water treatment plant, the use of coagulants to treat wastewater are better understood, which has led to significant optimization of process equipment and chemistry. Coagulation and flocculation are two common unit processes that are designed to remove very small particulate matter by forcing them to clump or stick together so that they will settle out and be removed from the wastewater as “sludge”. Since these related but separate processes require very different mixer design parameters for optimization of wastewater treatment, we will discuss coagulation here, and focus on flocculation in a separate article. Wastewater typically contains both dissolved and suspended solids that remain after preliminary settling, skimming, and screening, and are typically less than a micron in size. These tiny particles move about in Brownian motion and are kept in suspension by forces acting on them in the water. Presenting as turbidity, the individual particles cannot be seen and cause cloudiness in water similar to smoke in air. These remaining particles can be widely variant in shape, size, density, composition, and charge. The measurement of this turbidity is a key test of water quality. Most small particles in wastewater have a negative surface charge and are said to be “stable” in the suspension, meaning the particles repel each other as they come close together rather than sticking or clumping together. Coagulation is the process where the particle charge is neutralized or reversed to allow the waste particles to clump or stick together, making them easier to remove from the water stream. This process is often referred to as destabilization of the waste particles. The selection of a coagulant chemical depends on a multitude of factors. Water conditions such as pH and temperature, nature of the electrical double layer formed, equipment design, before and after unit operations, and of course cost, all have an effect on chemical choice. Commonly used coagulant chemicals are aluminum and iron salts. When the metal (Al, Fe) salts are added to water, hydrolization is very rapid and forms a series of metal hydrolysis species. When added to the wastewater, the charged ions in the colloidal solution neutralize the waste particle surface charge, allowing the particulates to clump together. This is a very simplistic view of the colloidal chemistry involved but explains agitation requirements for introducing the coagulant solution into the wastewater. The larger particles formed in the coagulation process are often referred to as micro-flocs, but this should not to be interpreted as flocculation, which is a separate process. The water surrounding a micro-floc should be clear. If the water is not clear, then all the waste particles may not have been neutralized, and therefore coagulation is not complete. More coagulant may be needed in parts of the volume of wastewater, possibly due to inadequate mixing or insufficient coagulant chemical addition. The alum and iron metal hydrolysis and absorption that takes place is relatively fast, making rapid mixing with high intensity critical to the coagulation process. Critical because this step is where the waste particles are destabilized and where the primary micro-flocs are formed, whose characteristics markedly influence subsequent flocculation kinetics. This intuitively leads to a mixer design that promotes low tank retention time and a high liquid volume turnover rate. In short – get it in, get it mixed as fast as possible, and get it out to the next unit operation. 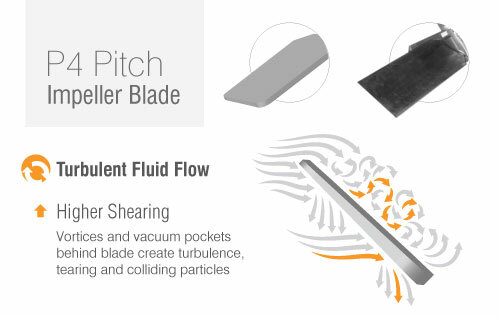 For high speed, high shear mixing, your best bet are pitch-blade impellers. They create a turbulent fluid flow that allows solids to collide and stick together. For our clients, we recommend the P4 Pitch impeller. Because the residence time in flash mixing is short (usually less than 60 seconds), the mixer needs to be configured with a high G value / velocity gradient (400 – 1000 sec-1). This has to be calculated by your mixing team. At Dynamix, we typically add an additional 15% on top of the calculated G value to make sure everything gets evenly dispersed. While not actually part of the mixer, adjusting the tank configuration can minimize short circuiting. 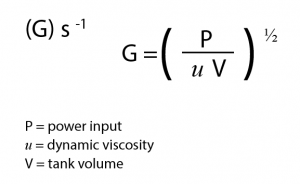 To maximize particle contact, we recommend flowing in from the bottom and the flowing out from the top. Dynamix has application engineers that know and understand Coagulation. If you are unsure whether your current mixer is properly sized, or wish to get a quote for a coagulation mixer, leave a comment or contact us at [email protected], and we will provide you with our recommendations.